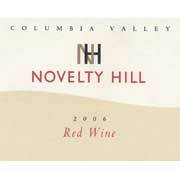 Mike Januik, winemaker at Novelty Hill, is a well-recognized talent in the Washington wine industry. His namesake Januik label has long been a favorite of mine (his Chardonnay was placed in our wine club earlier). Actually, his wines have been a favorite of many. At least 12 wines from his hand have been included on Wine Spectator’s Top 100 lists. The value “Novelty Hill” label started just a few years ago and the releases have been an excellent and affordable way to enjoy Washington’s best on a daily basis. Much of the fruit for this wine comes from the estate-owned Stillwater Creek Vineyards. The 2006 red is a cacophony of varietals including 33% Syrah, 18% each of Cab Franc and Mourvedre, 13% Merlot, 11% Cabernet and 7% Petit Verdot. Generous and round offering delicious, ripe red plum, blueberry and currant aromas and flavors, with a lip-smacking, spicy finish. What I most like about the Novelty Hill wines (and other Januik releases) is the restraint away from overextraction. These wines aren’t fruit bombs, where blasts of fruit cover up the flaws found in many value and “second label” wines. Instead, Novelty Hill wines give you the fruit you want while allowing the character of Washington to come forward. Spice, wood, tea, tannin, herbs and other delicate notes can enhance the complexity and create a perfect match with any meal, whether dramatically flavored or elegantly sublime. This wine is regularly sold for $14.99, but is available to wine club members for only $13.99!